In this recipe, you will learn how to use correctly the point cloud and mesh filters in Zephyr. Albeit not properly a tutorial, this guide can improve the final results you get in Zephyr. Decimation: select the desired point cloud with the dropdown menu and the number of desired points. The point cloud will be regenerated decimating the point count to the maximum specified value. Densification: select the desired point cloud with the dropdown menu and the number of desired points. 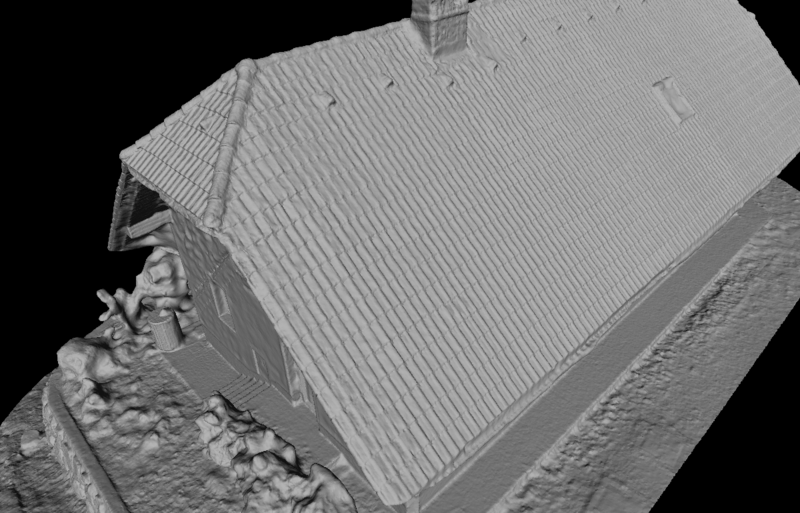 The point cloud will be regenerated densifying the point count to the maximum specified value. Only structured point clouds can be densified. Decimation: select the desired mesh with the dropdown menu and the number of desired vertices. The mesh will be regenerated decimating the vertex count to the maximum specified value once. Densification: select the desired mesh with the dropdown menu and the number of desired vertices. The mesh will be regenerated using the vertex count to the maximum specified value once. Laplacian smoother: will smooth the surface of the selected mesh. Reduces noise and won’t keep sharp edges. More iterations mean a smoother final result. Bilateral smoother: will smooth the surface of the selected mesh. Reduces noise while trying to keep sharp edges where possible. More iterations mean a smoother final result. Fill holes: will fill the mesh holes. From the selection window, it is possible to select a specific hole (in the workspace scene the hole border will be highlighted with a border) or all holes of a certain size (or all holes). The color of the triangles that will close the hole will most likely wrong when the missing visibility of the point from the camera will behave in a degenerate way (and, obviously, it is impossible to identify the color of something that is not seen by any picture). Two algorithms are available, watertight and selective. While the selective one can close the selected hole in a fast way, it might not work for complex cases, in which case we suggest to you the watertight algorithm. Retopology: you may use this filter to let Zephyr try to execute the mesh retopology algorithm – this filter will try to simplify and generate a better organized mesh with bigger triangles where possible. The higher the factor, the bigger the triangles. Please note that running this filter may result in mesh details loss. Photoconsist Mesh Optimization: the photoconsistency based mesh optimization will adjust the triangle positions to maximize the photoconsistency of their reprojection. You may run this filter directly when reconstructing a mesh (in some presets this feature is disabled, but you may always enable it from the advanced or custom settings) or after a mesh has been reconstructed from this menu. When you have a good geometry in the mesh to begin with, it’s advised to keep a high resolution in the photoconsistency mesh optimization (50% – 75%) while if you have a low quality mesh as input, you should keep a lower resolution (25%). Following, some examples and more details about the photoconsistency. Following, a detailed explanation of the photoconsistency based mesh optimization as well as a practical guide with examples. Target reprojection area (20): controls the size that every triangle will try to obtain at the end of the photoconsistency process. Given a triangle, its final reprojection area (in pixels) to the nearest camera will tend to get near to the specified value. Lowering this value will make a denser mesh: the final mesh will then have a variable level of detail, with a higher vertex point cloud corresponding to those areas that are viewed by nearer cameras. In most cases the default value will work well; in case you are dealing with a mesh that is already very good (for example, one that has already finished a photoconsistency step) this parameter can be decreased to try and extract even more details, while it can be increased in case of noisy meshes and low quality images. Number of neighbour cameras (4): for each camera, a number N of neighbouring cameras are chosen that will compose the pairs that the photoconsistency algorithm will use. Increasing this parameter will increase the final accuracy as well as increase the computation time. In most cases, the results you can achieve with the default value of 4 and with higher values are very similar, since the information that can be extracted with 4 cameras is often enough to reconstruct most details of the subject. This parameter should be decreased only in special cases, for example for preliminary tests or if you don’t need high accuracy. Use Symmetric pairs (no): when this option is enabled, the algorithm will analyze each pair of cameras (A, B) int a symmetric way (A towards B, B towards A) during each iteration. If this option is not selected, the analysis will be interleaved in between each iteration ( A to B when odd, B to A when even). Usually, the final level of detail is very similar regardless of the value of this option. We suggest leaving this option unchecked, as it will cut the computation time in half or use it only for very small datasets. Max iterations (40): controls the maximum iterations of the algorithm. We suggest leaving this value on default, as the algorithm will usually converge to the optimal solution. You may decrease this value however if the starting mesh already has very good detail, for example, if the input mesh is the output of a previous photoconsistency step. Convergence Relative Tolerance (0.0150) : This parameter controls when the minimization algorithm should stop as the solution is converging (as more iterations would still yield a very similar result). Increasing this value too much might stop the algorithm too early, thus yielding lesser details. Decreasing this value too much expose you to the risk to have too many iterations (up to the max iterations values). Although decreasing this value will not worsen results, it will increase computation times. Image resolution (50): controls the resolution scale of the images that will be used internally by the photoconsistency algorithm. Hierarchical subdivision (1): if this value is greater than zero, the photoconsistency algorithm will be applied more times in a sequential way, automatically adjusting the image resolution and the iteration number. This means that the same results can be obtained by running the same algorithm multiple times with different and appropriate settings. Usually, you should not run the algorithm in hierarchical mode, as it is advisable to run one single process at high resolution so that you can keep the details that have been already extracted.